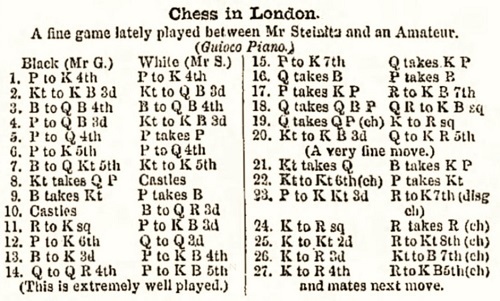 ‘With the exception of about four games the play was confined to some form of the Queen’s Pawn Opening , and this weary persistence may be attributed to the “hypermodern” policy which is a marked feature of the efforts of present-day master players when contesting against each other. 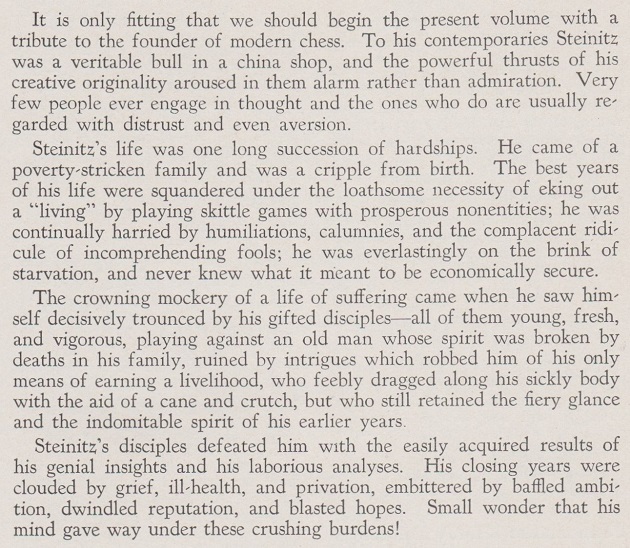 Also to the fact that, of all the openings on the chess board, pawn to queen’s fourth in its various phases calls for more close analysis and sound judgement than any other debut. In the Internet age, the opening choices of the world’s best players are frequently attacked in real time by nameless ten-opinions-an-hour individuals for whom suitable advice would be: kibitz inwardly. 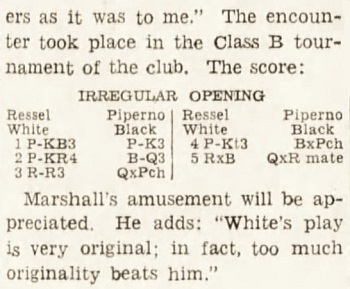 C.N.s 3619 and 8023 asked for more information about the game Mannis Charosh v L. Jaffe, New York, 1936 on page 10 of Irving Chernev’s 1000 Best Short Games of Chess (New York, 1955): 1 d4 c5 2 d5 Na6 3 Nf3 d6 4 e4 Bg4 5 Ne5 Qa5+ 6 Bd2 dxe5 7 Bxa5 Bxd1 8 Bb5 mate. 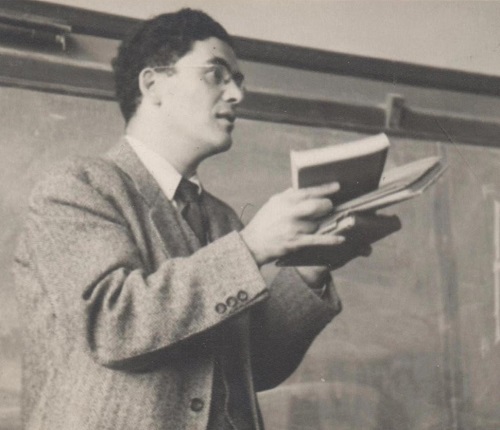 Moshe Rubin (Jerusalem) has taken up the matter with the late Mannis Charosh’s son Paul, who states that Black was ‘Louis Jaffe, a history teacher at New Utrecht High School (Brooklyn) and a colleague of my father’. 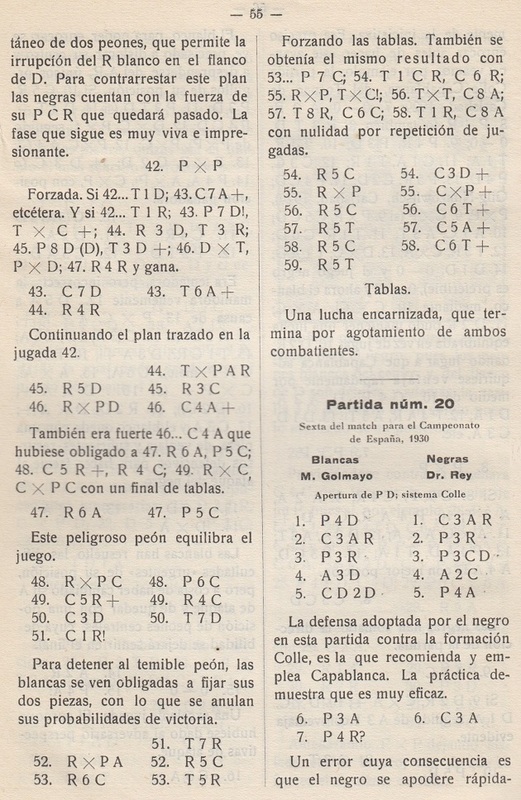 The match between Manuel Golmayo and Ramón Rey Ardid for the Spanish championship was held in Barcelona in December 1930. 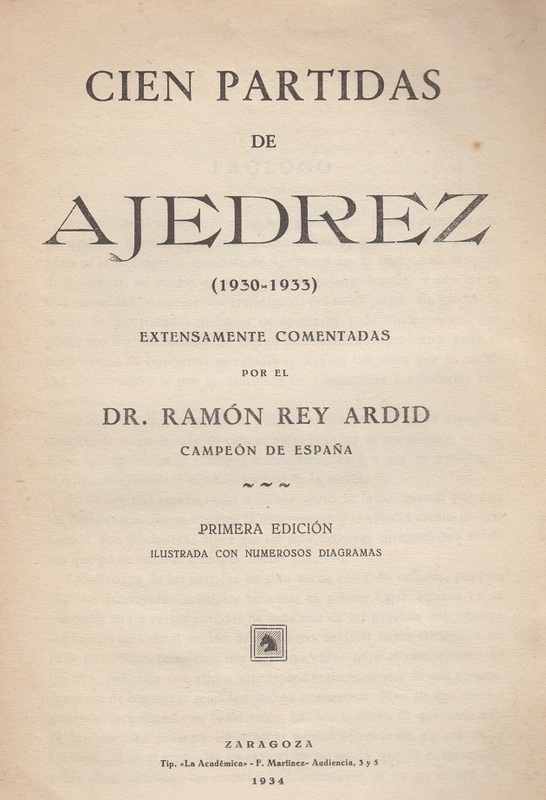 Rey Ardid won +4 –1 =2 and annotated all the games on pages 39-65 of his book Cien partidas de ajedrez (Saragossa, 1934). 1 d4 Nf6 2 Nf3 e6 3 e3 b6 4 Bd3 Bb7 5 Nbd2 c5 6 c3 Nc6 7 e4 cxd4 8 cxd4 Nb4 9 Bb1 Ba6 10 e5 Nfd5 11 Ne4 Qc7 12 a3 Nc6 13 Bd3 Bxd3 14 Qxd3 Be7 15 O-O f5 16 Nc3 Nxc3 17 Qxc3 Qb7 18 b4 Bd8 19 Bg5 Bxg5 20 Nxg5 O-O 21 Rac1 Rac8 22 Qb2 Ne7 23 Rxc8 Rxc8 24 Rc1 Nd5 25 Nf3 Rxc1+ 26 Qxc1 Qc7 27 Qxc7 Nxc7 28 Ne1 Kf7 29 Kf1 Ke7 30 Ke2 d6 31 Kd3 Kd7 32 Nc2 g5 33 exd6 Kxd6 34 Ne3 b5 35 f3 Nd5 36 Nxd5 Kxd5 37 Kc3 h5 38 Kd3 h4 39 Kc3 g4 40 Kd3 h3 41 White resigns. 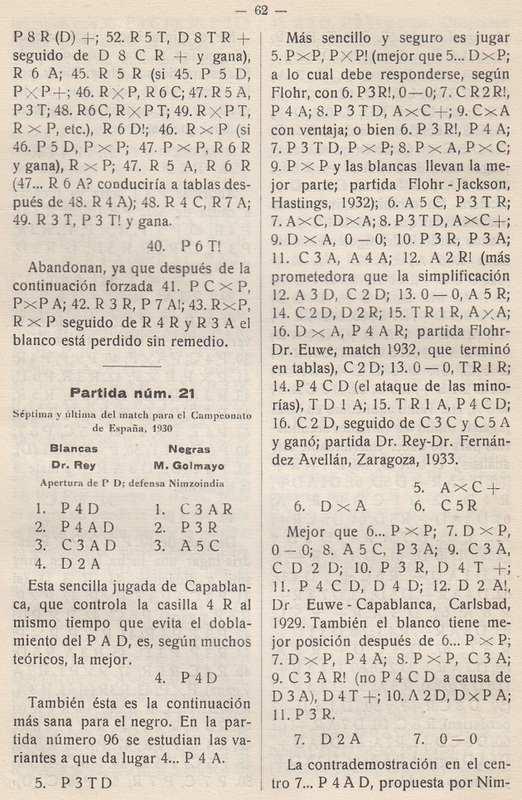 The Evergreen Game was not ‘against the pseudonymous Dufresne (in reality the German player E.S. Freund)’. Dufresne was his name, and E.S. Freund was his pseudonym. 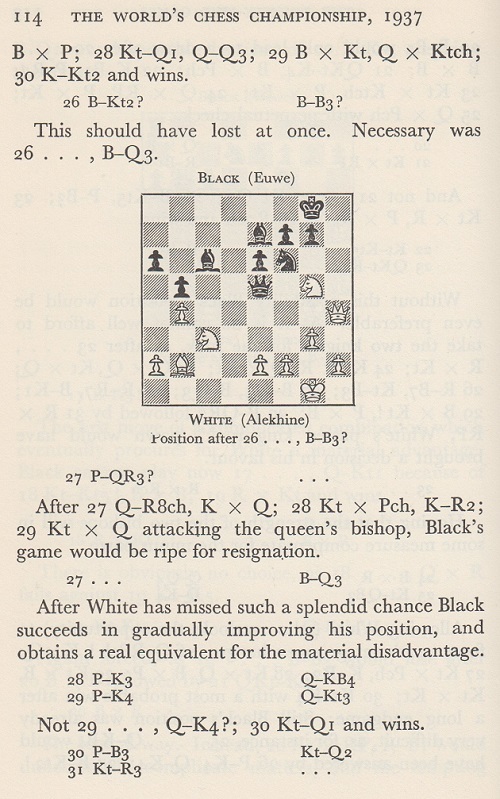 Raymond Keene made the same obvious gaffe 30 years ago, on page 136 of his Pocket Book of Chess (London, 1988), as pointed out in C.N. 10155. See too Cuttings. The nickname for F.A. 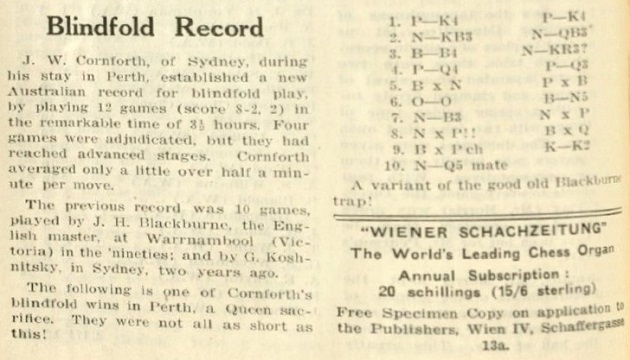 Crowl, ‘the Australian Nimzowitsch’, was the heading to his game against L. Steiner in the 1936-37 Australian championship in Perth on page 57 of the Australasian Chess Review, 27 February 1937. It arrived this morning, and we have not yet progressed beyond the desperately superficial bibliography on page 5 and the welter of unsourced quotes by and about Lasker on pages 9-12. See too Chess and Draughts/Checkers. 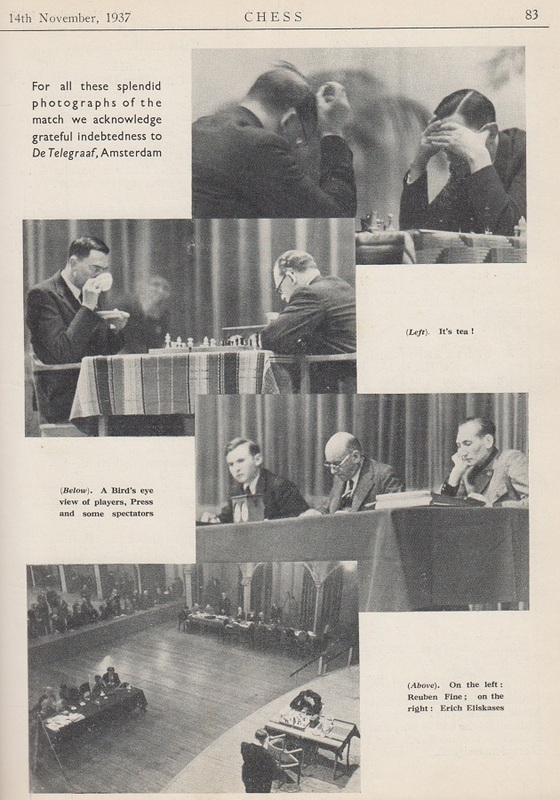 Before discussing blunders in the game, we point out one in the book: Alekhine was White. 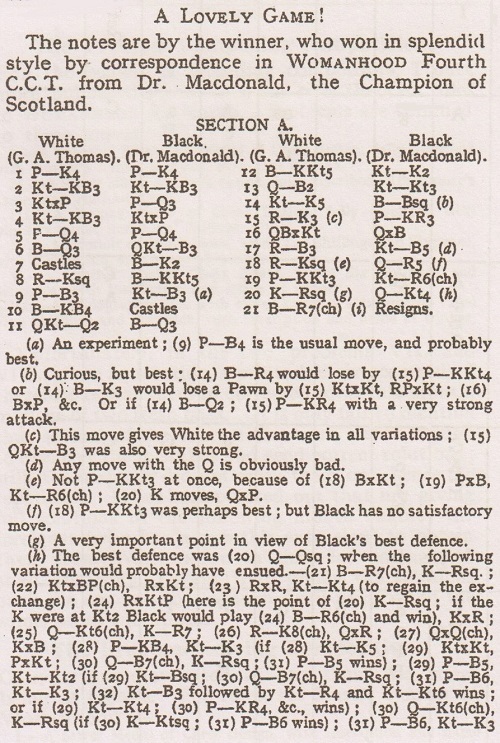 Information about the reference to the Star in the note to Black’s 26th move will be appreciated. 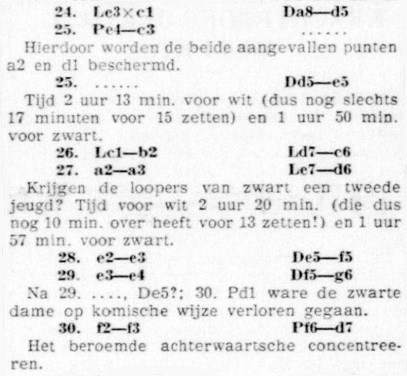 Did other Dutch newspapers of the time have further information? 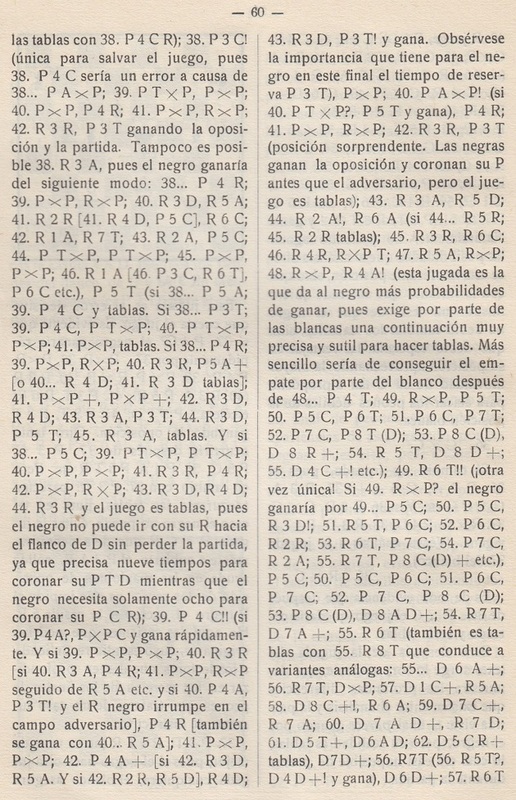 Source: The Era, 25 June 1871, page 7. 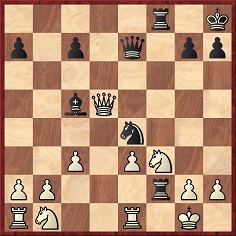 20...Qh4 21 Nxh4 Bxe3 22 Ng6+ hxg6 23 g3 Re2+ 24 Kh1 Rxe1+ 25 Kg2 Rg1+ 26 Kh3 Nf2+ 27 Kh4 Rf4+ 28 White resigns. 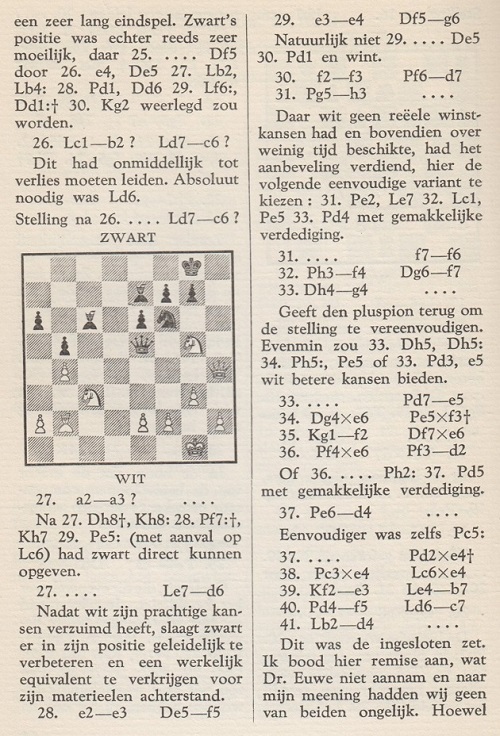 The note after 27 a3 states that it was only at that point that Euwe was seen to turn his attention to “the endangered corner of the board”, after which “a sigh of relief went through the playing hall”. 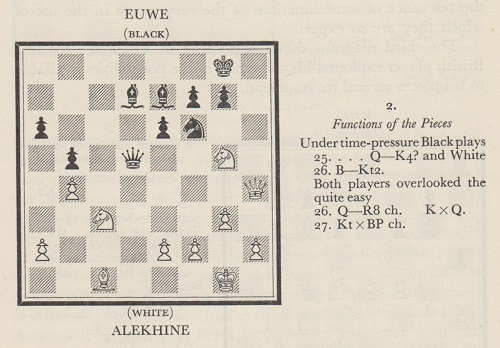 As already demonstrated, it was Alekhine, not Euwe, who was short of time. Writers wishing to revel in world champions’ lapses may choose to ignore the issue of clock-pressure. 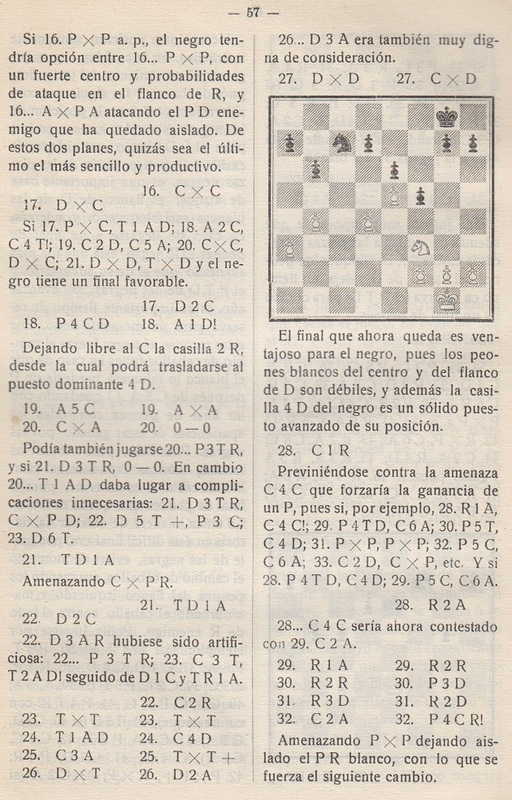 See, for instance, pages 29-30 of The Inner Game of Chess by A. Soltis (New York, 1994) and pages 140-141 of the same author’s Chess Lists (Jefferson, 2002). 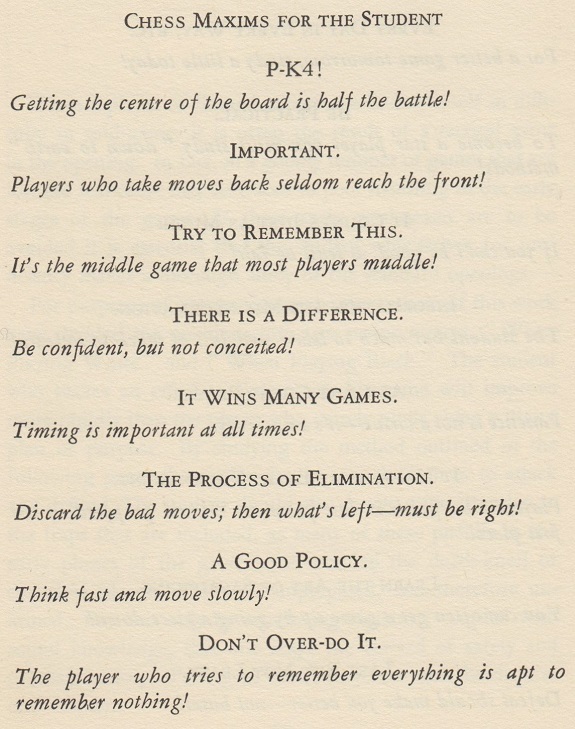 It may be pointed out, however, that Alekhine’s own annotations to the game, in his match book, had only one reference to the clock, and it was later in the game: he stated that at move 31 he ‘was very short of time’. 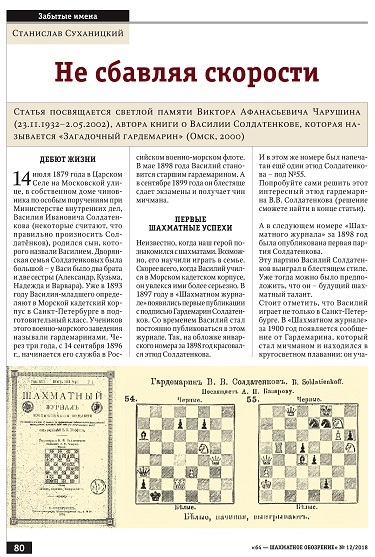 Alekhine’s general view about time-shortage not being an excuse may be recalled from C.N.s 7973 and 10354. 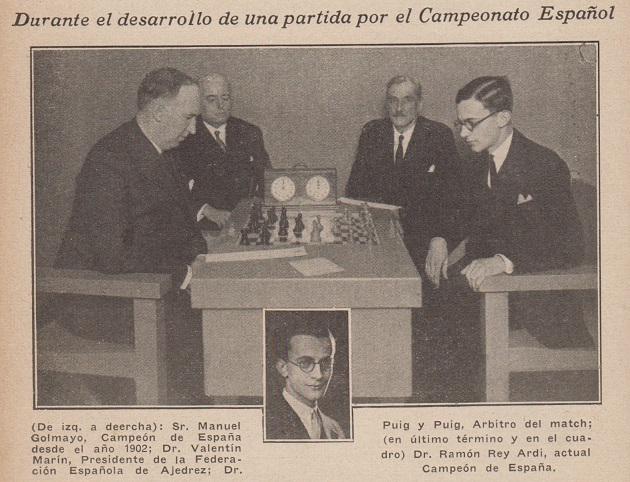 Discussing the Lasker v Tarrasch world title contest, page 247 of Lasker move by move by Zenón Franco (London, 2018) has the phrase ‘the “Match of the Century”, as it was called at the time’. 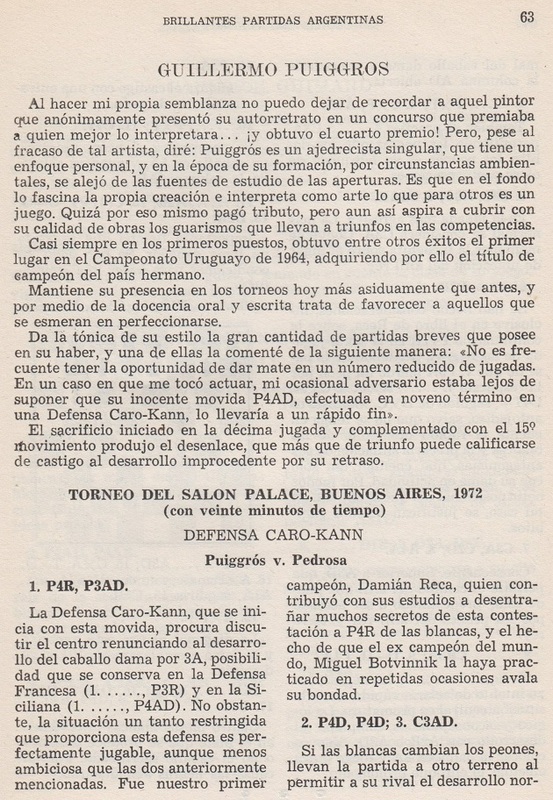 Page 298 of Z. Franco’s book on Lasker shows his awareness that the only world title match between Lasker and Janowsky was in Berlin in late 1910. 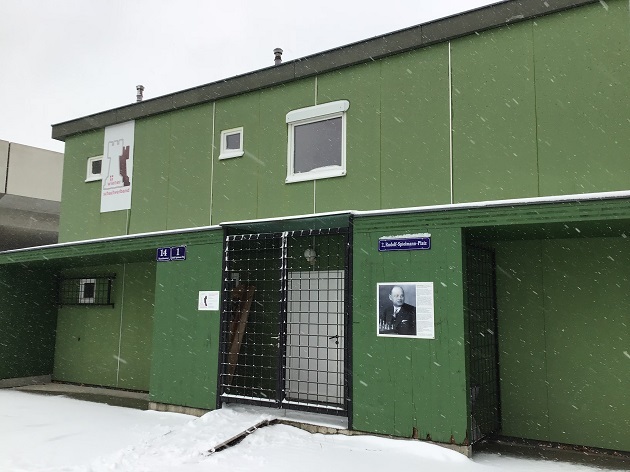 The venue was the residence of Léonardus Nardus. See too Lasker v Janowsky, Paris, 1909. 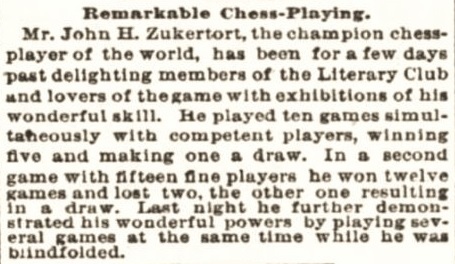 Which chess master drew a 20-game world title match against Steinitz, also defeating Zukertort by ten games to two, Lasker by ten games to five, and Mason by ten games to zero? Rather than a ‘normal check-up’, a split-second glance at G.J. Kelly’s letter should have been enough. 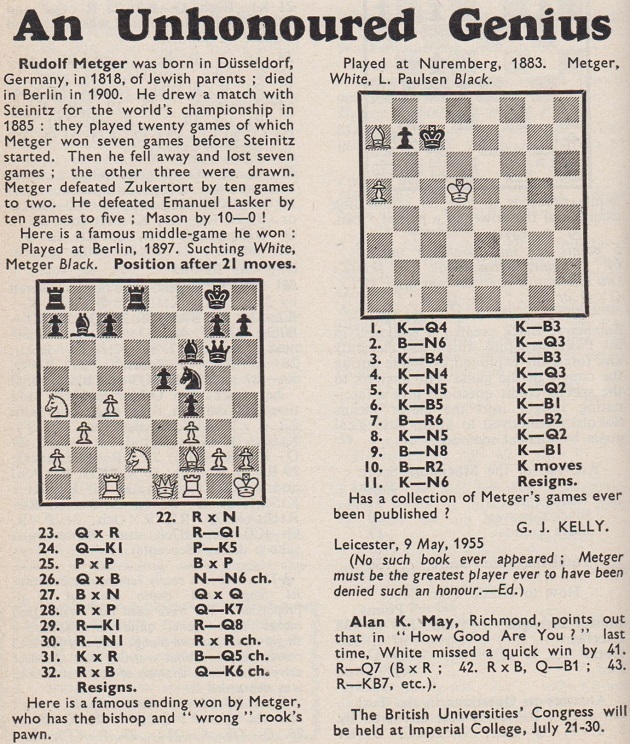 The first position was from the game between Hugo Süchting and Johannes Metger, Berlin, 30 September 1897, as given on pages 144-145 of Warren H. Goldman’s tournament book (Düsseldorf und Kempten/Allgäu, 1966). Johannes Metger v Paulsen, Nuremberg, August 1888 was discussed in C.N.s 9897, 9902 and 9927. 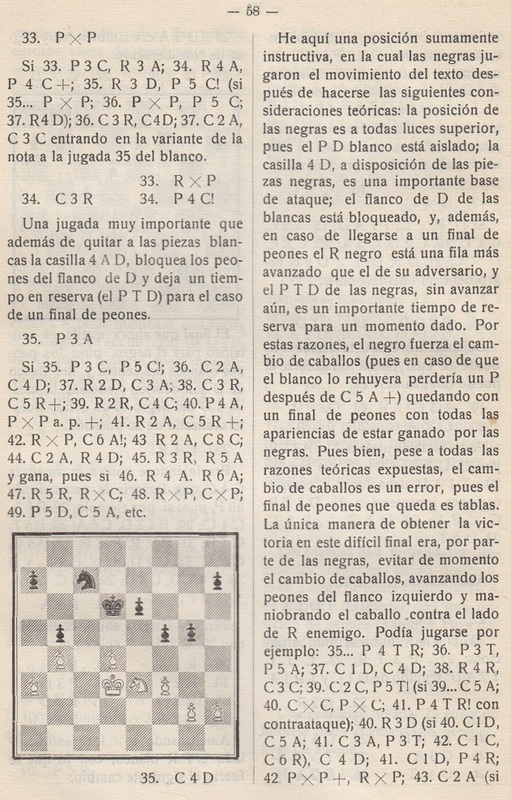 1 e4 c6 2 d4 d5 3 Nc3 dxe4 4 Nxe4 Bf5 5 Ng3 Bg6 6 f4 e6 7 Nf3 Nd7 8 Bc4 Ngf6 9 O-O c5 10 f5 exf5 11 Nh4 Be7 12 Ngxf5 O-O 13 Qe2 Re8 14 Nxg6 hxg6 15 Bxf7+ Kxf7 16 Qc4+ Kf8 17 Nh6 Resigns. ‘Thus the match, which the German Schachbund took such pains to bring about, was veritably an encounter of giants, and justified the widespread interest that was taken in it. Surely never before has the daily press devoted so much attention to our game. 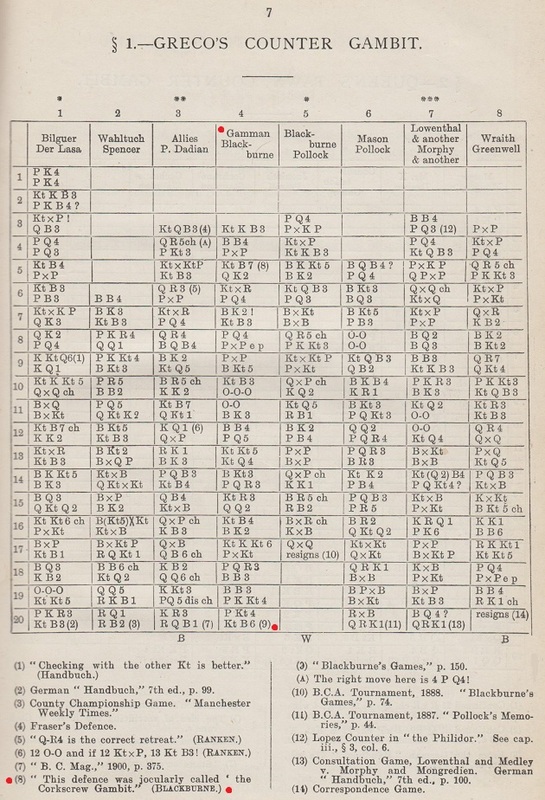 All over the world – even in far-away Japan – the course of the match was followed with close interest, and no doubt the circle of chessplayers has been greatly widened by the unique advertisement thus given to the game. 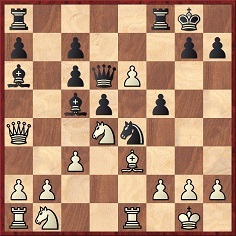 The reference ‘543’ relates to the following moves in the openings chart on page 401: 1 e4 e5 2 Nf3 f5 3 Nxe5 Nf6 4 Bc4 fxe4 5 Nf7 Qe7 6 Nxh8 d5. 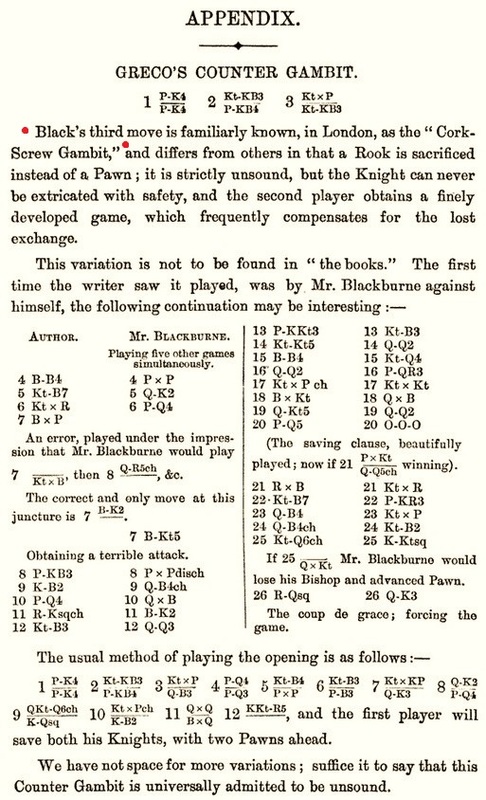 We also note a Cook v Blackburne game on page 74 of Synopsis of the Chess Openings by William Cook (London, 1874), where the ‘Corkscrew Gambit’ move was identified as 3...Nf6 and, again, there was no claim that the name had been coined by Blackburne. 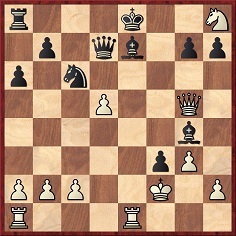 20...O-O-O 21 Rxe7 Nxe7 22 Nf7 h6 23 Qf4 Nxd5 24 Qc4+ Nc7 25 Nd6+ Kb8 26 Rd1 Qe6 and wins. Can readers assist in taking this matter forward? Our latest feature article is Underpromotion in Chess. 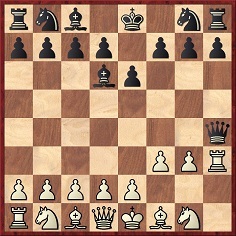 1 e4 d5 2 e5 d4 3 Bd3 Nd7 4 e6 fxe6 and White mated in three moves. ... the heavyweight sacrifice 6 Qxg6+ is more ‘aesthetically pleasing’ than the restrained 6 Bxg6+ line. 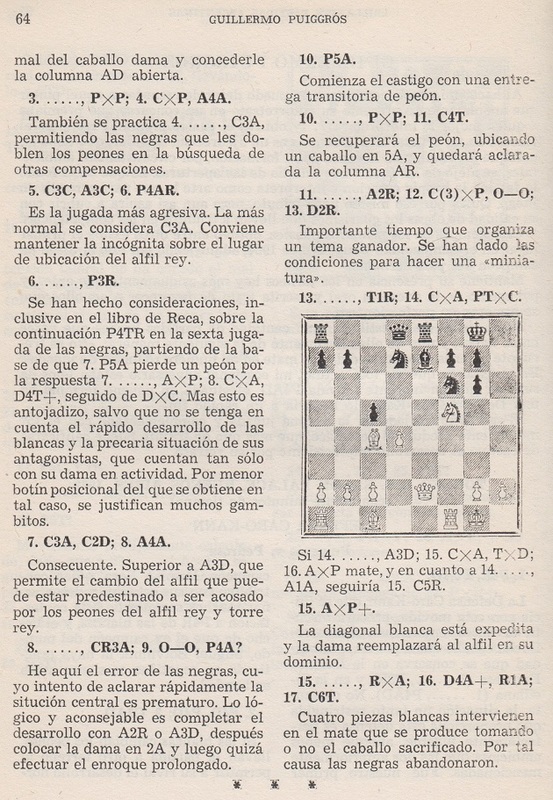 For other positions relevant to this topic see page 145 of A Chess Omnibus, as well as page 9 of Chess Facts and Fables (C.N. 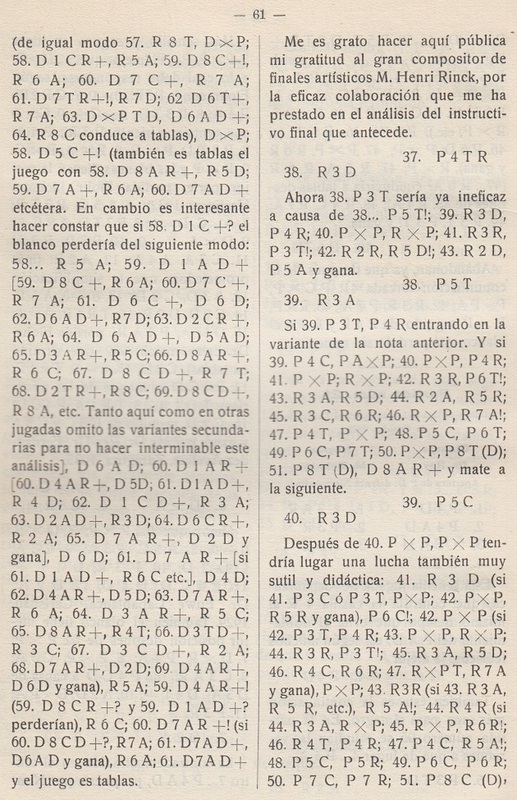 3034). 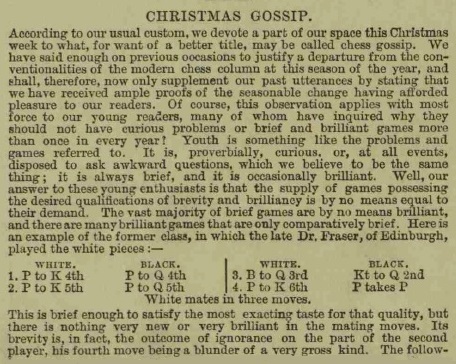 Information about ‘the late Dr Fraser, of Edinburgh’ and the occasion of the game is still being sought. 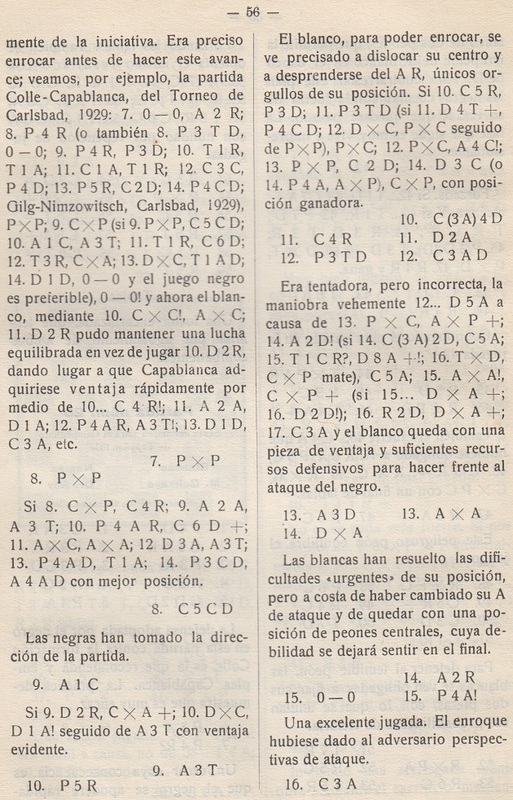 4...Bxg3+ 5 Rxg3 Qxg3 mate. As mentioned in C.N. 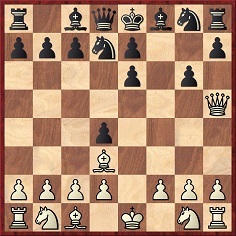 3382, 4…Qxg3+ would have given a five-move game with two consecutive queen sacrifices. 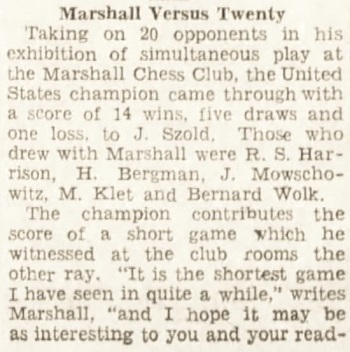 The wording in the Brooklyn Daily Eagle indicates that the game was played in January 1934. 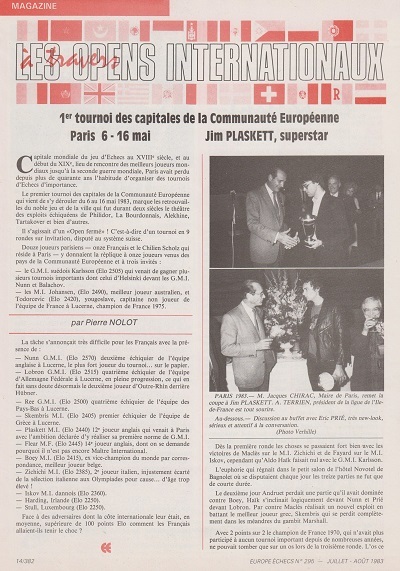 An interview with the organizer, Jean-Pierre Girard, on pages 16-17 mentioned that the European Economic Community had participated in funding the tournament. An earlier contest that comes to mind is the First Team Championship of the European Economic Community in Ostend, September 1975. It involved all nine Member States and was won by the Netherlands. The reports that we have consulted (e.g. on pages 517-518 of the December 1975 BCM) indicate no specific involvement by the European body. 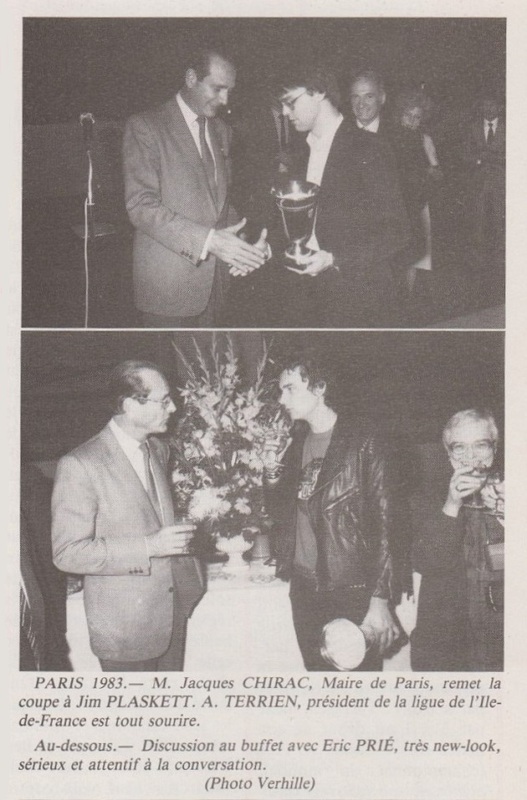 Information about notable chess events connected with the European Economic Community/European Union will be welcomed. 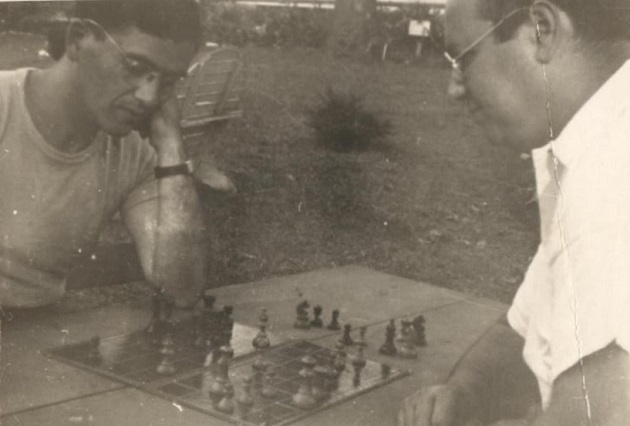 Concerning CHESS The Musical, at the end of November 2018 the curators of the Digital Collections of the New York Public Library added a fine set of photographs. The precise source is Martha Swope Photographs Collection, available via the Billy Rose Theatre Division. 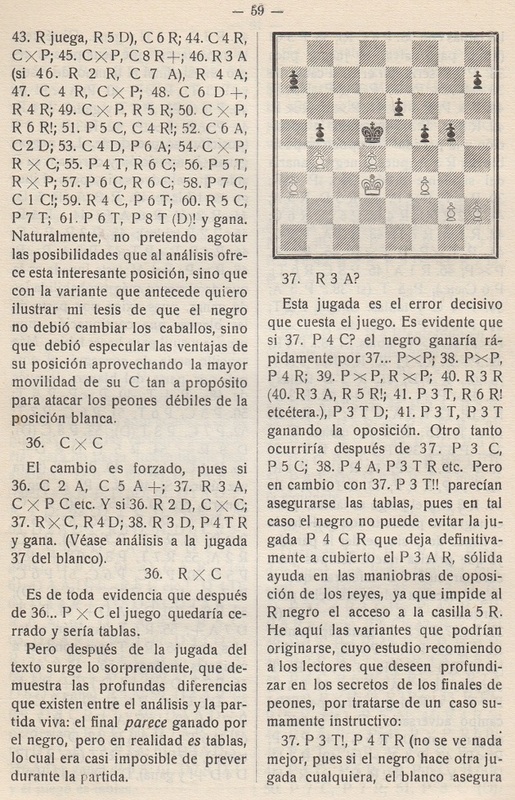 Page 299 of CHESS, 4 August 1956 referred to ‘David Robb, editor of one of America’s greatest chess columns, that in the Cleveland Plain Dealer’. Wanted: information about Robb and some highlights from his column. 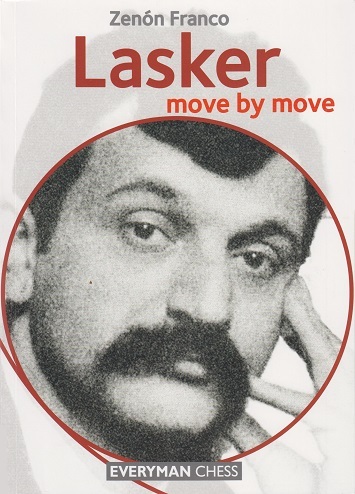 Two books by Edward Lasker quoted a conversation with Janowsky in Berlin in 1910, at the time of the latter’s world title match against Emanuel Lasker. 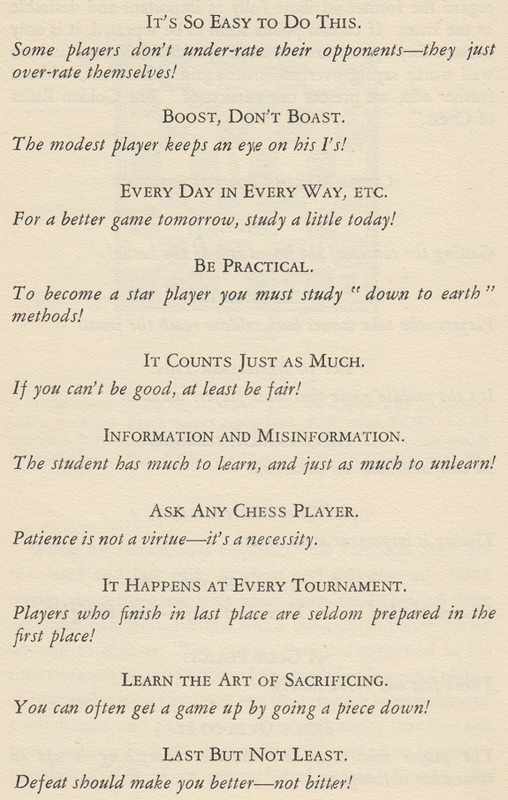 Edward Lasker’s statements on chess history require caution. 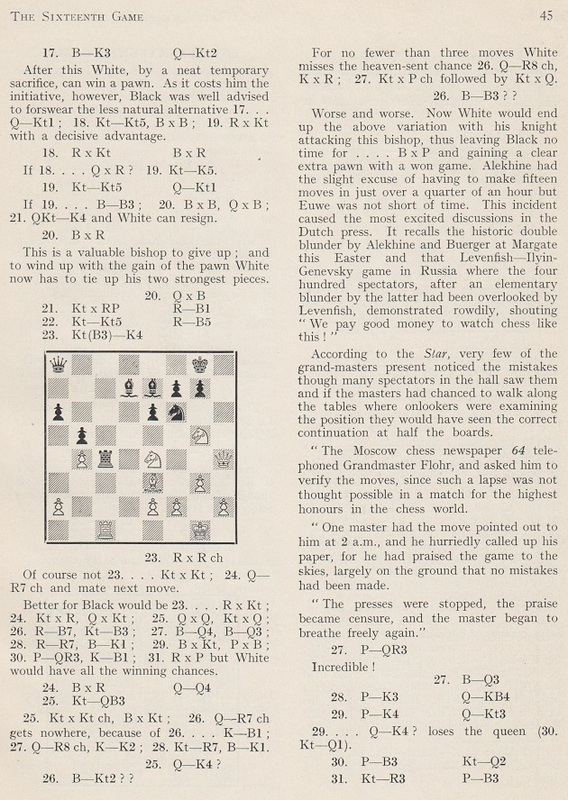 For example, page 101 of The Adventure of Chess placed both of the longer Lasker v Janowsky matches in Berlin. 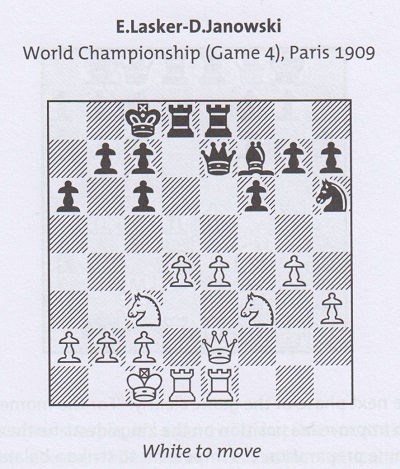 On that point, page 88 of Chess Secrets I Learned from the Masters was correct (the former ‘took place in Paris in the fall of 1909’) but wrongly asserted that it was for the world title. 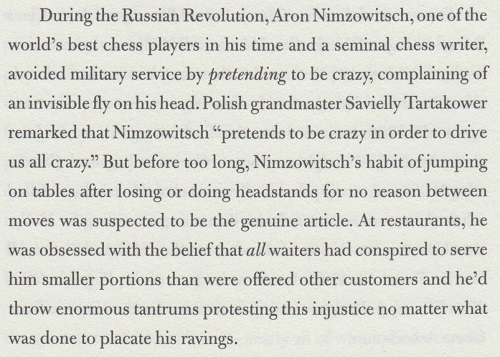 Throughout Chess Secrets I Learned from the Masters Edward Lasker used the spelling ‘Nimzóvich’, indicating stress on the second syllable. 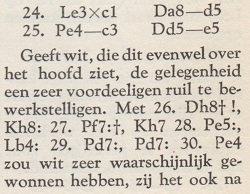 On page 241 of the August 1947 BCM Jacques Mieses referred to ‘Aron Niemzowitsch – four syllables with the accent on the last but one, thus: Ni-em-zó-witsch After 1920, however, he called himself willy-nilly Nimzowitsch’. The pronunciation ‘Nimzó-Indian’ could be regarded as the logical consequence. Zukertort’s visit to Cincinnati was referred to in C.N. 5773, with mention of a loss to Ettlinger. 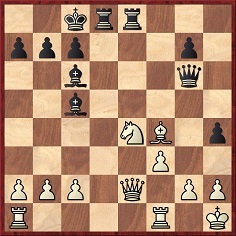 18...h3 19 Rae1 Rd4 20 Bg3 Rdxe4 21 fxe4 Rxe4 22 White resigns. 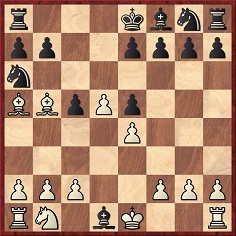 18 Re1 Qh4 19 g3 Nh3+ 20 Kh1 Qg5 21 Bh7+ Resigns. 11159. Was Alexander McDonnell a soldier? ‘Is anything at all known about the physical appearance of Alexander McDonnell, or about what he did before embarking upon his career as a merchant? A little information can perhaps be gleaned from a Royal Artillery drivers’ description book deposited in the National Archives at Kew (WO 69/654). Folio 37 includes, on the fifth line, an entry for the driver Alexr McDonell [sic], who was enlisted by Lieutenant Clark on 1 February 1814, in Lisburn (Ireland), aged 15. He is described as five feet three inches in height, with a swarthy complexion, brown hair and blue eyes, having been born in Belfast, in the county of Antrim. He had no trade or calling, and was first mustered in the 7th Battalion, posted to Troop “B”. He was discharged on 28 February 1817 in Ireland. 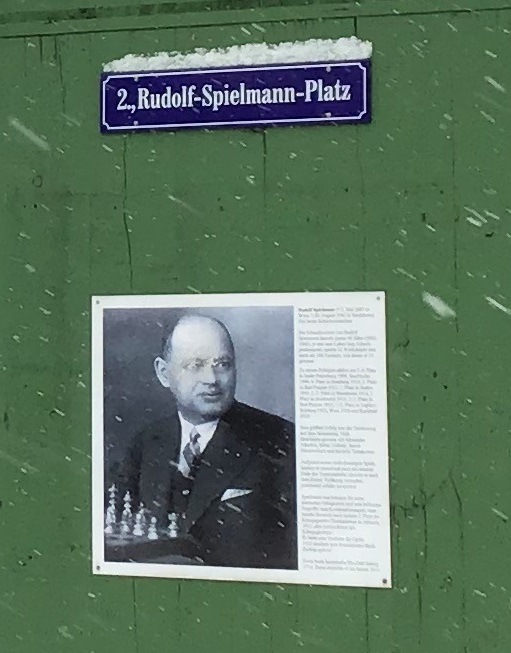 Was this driver the celebrated chessplayer? His name, age and place of birth are all plausible, but would one not expect the son of a merchant to join the army as an officer? In C.N. 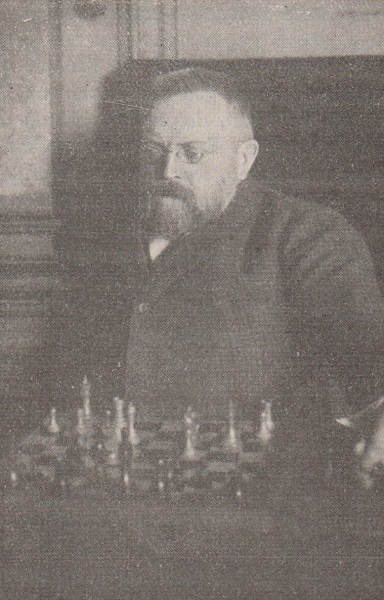 10662 the father of the chessplayer was identified as Thomas McDonnell (/MacDonnell), a merchant. James O’Fee, in his article Still Researching Alexander McDonnell 2010: Part 4, cited a death notice in the Belfast News Letter announcing that Mr Thomas M’Donnell, a merchant of Belfast, had died on 17 January 1809. The website Findagrave reports a memorial in Knockbreda Cemetery, Belfast to a Thomas McDonnell who died on that date. 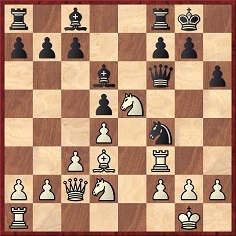 1 e4 e5 2 Nf3 Nc6 3 Bc4 Nh6 4 d4 d6 5 Bxh6 gxh6 6 O-O Bg4 7 Nc3 Nxd4 8 Nxe5 Bxd1 9 Bxf7+ Ke7 10 Nd5 mate.